Pedigree Schmackos are a deliciously tasty complementary pet food for adult dogs. Schmackos are made with delicious fresh meat for a great taste and packed with vitamins and minerals, calcium and Omega 3. Containing Omega 3 to help keep him fit for life and Calcium, Vitamins and Minerals to help give him strong teeth and bones and help maintain natural defences. 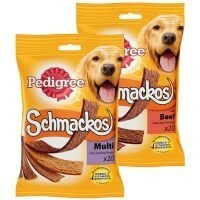 Pedigree Schmackos can be given as a treat of as a training aid. Ingredients: meat and animal derivatives, derivatives from vegetable origin, various sugars, minerals, oils, fats, cereals and yeasts. 1 pack contains 20 sticks.